While Donald Trump’s U-turn on the Syrian conflict has been well documented, high ranking officials in his administration seem to be sending mixed signals on Syria policy too, contradicting each other’s statements and confusing social media and own ranks, it seems. Trump famously advised former President Barack Obama not to attack Syria, but did so himself on Thursday night, ordering 59 Tomahawk missiles to be fired at a Syrian military airfield near Homs. But the entire Syrian narrative appears to be in a constant state of flux with US officials, who seem to flip-flop on Syrian President Bashar Assad’s future and US priorities in the war-ravaged country so often it’s becoming hard to keep up with their stance. A mere week before dozens of missiles hit the Syrian army airfield in the rebel-held southern Idlib province, US Secretary of State Rex Tillerson hinted that the resignation of Assad, once considered a prerequisite for Syrian settlement by the Obama administration, was no longer of interest to Washington. “I think the... longer term status of President Assad will be decided by the Syrian people,” the US top diplomat said, speaking at a joint conference with Turkish foreign minister Mevut Cavusoglu on March 30. However, days after the suspected chemical attack in Khan Sheikhoun in Syria’s Idlib province, which was immediately blamed on Assad in the West, Tillerson signaled another change of mind saying that the “steps are under way” in forming an international coalition which would seek to remove the Syrian President from power. “Assad’s role in the future is uncertain and with the acts that he has taken, it would seem that there would be no role for him to govern the Syrian people,” he told a press briefing on April 6. Haley, in the meantime, seemingly pushed for a military intervention branding it an appropriate response to the uninvestigated chemical incident, brandishing photos of children who allegedly suffered death from sarin gas to champion her cause before the United Nations Security Council. Days after saying political reality meant Assad would stay, Tillerson says “there would be no role for him to govern the Syrian people." “When the United Nations consistently fails in its duty to act collectively, there are times in the life of states that we are compelled to take our own action,” Haley said at the UN Security Council meeting on Wednesday. In the aftermath of the US cruise missile strike on Thursday night, which claimed lives of Syrian soldiers as well as civilians living in nearby villagers, while not inflicting any substantial damage to the airbase itself, the US top diplomat then suddenly took a step back from the regime change rhetoric. In an interview with ABC’s "This Week" on Sunday, Tillerson pointed that the crisis in Syria can be solved only through a political process with both parties of the intra-Syrian conflict participating, as achieving political solution "clearly requires the participation of the regime and the support of their allies." "It is through that political process that we believe the Syrian people will ultimately be able to decide the fate of Bashar Assad," he said, stressing that the US has learned its lesson from aversive effects of a “violent regime change” in Libya. "Obviously the United States' own founding principle is self-determination, and what the US and our allies want to do is to enable the Syrian people to make that determination,” he said, adding that the US’ man focus in Syria is defeating Islamic State (IS, formerly ISIS,ISIL). However, this time two of the most senior diplomats in the Trump administration appeared to send mixed signals, as Haley kept insisting that there are no viable political options with Assad in power. “We know that there is not any sort of option were a political solution is going to happen with Assad at the head of the regime,” she told CNN’s ‘State of the Union’ responding to the question if the regime change in Syria can be considered now the official stance of the US. Tillerson: Take out ISIS, maybe not Assad. McMaster: Take out ISIS & Assad simultaneously. Haley: Regime change will happen. 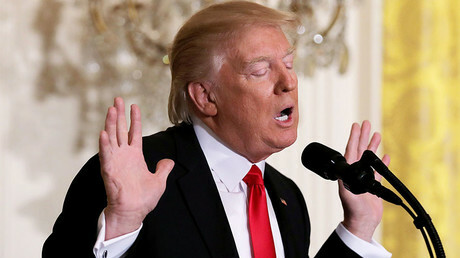 Trump’s flip-flopping lead was followed by senior Republican lawmakers, including Senate Republican leader Mitch McConnell (R-Ky) and House Speaker Paul Ryan (R-Wis.) While both lawmakers, like Trump, opposed the military action in Syria when it was mulled by Obama, with Ryan arguing in 2013 that such an “ill-conceived” decision would make US “look weak,” they hailed Trump for effectively doing just that. POLL of Trump supporters: Do you support @realDonaldTrump's new policy demanding regime change in Syria? The confusion over what policy on Syria the US administration is currently pursuing forced Trump’s national security adviser H.R. McMaster to assure the public that there is no conflict between Tillerson and Haley’s statements. “There has to be a degree of simultaneous activity as well as sequencing of the defeat of IS first,” McMaster told “Fox News Sunday,” saying that removing Assad and dealing a final blow to ISIS are “simultaneous” goals. All this did not stop Trump critics from suggesting in a swarm of posts on social media that the confusion simply meant the 45th US president simply doesn’t have a defined Syria policy at all. Trump administration is pumping out disparate opinions whether the policy is regime change in Syria. This is due to confusion not strategy.